What a long way for the pioneer of French electronic music since his departure from the GRM of Pierre Schaeffer – the father of musique concrète et électroacoustique (concrete and electroacoustic music) – where he spent two years (from 1969 to 1971) that turned out to be decisive for the remainder of his career. After fifty years of introducing an entire generation to electronic music and becoming the most famous French artist outside of his borders, Jean-Michel Jarre is revisiting his abundant discography with this Planet Jarre compilation that gathers 41 tracks divided into four parts. The first album features, like its title Soundscapes suggests, musical landscapes, contemplative tracks bordering with ambient music, including the melancholic The Heart of Noise (The Origin) as well as two extracts from Oxygène 3 from 2016, Parts 19 and 20. 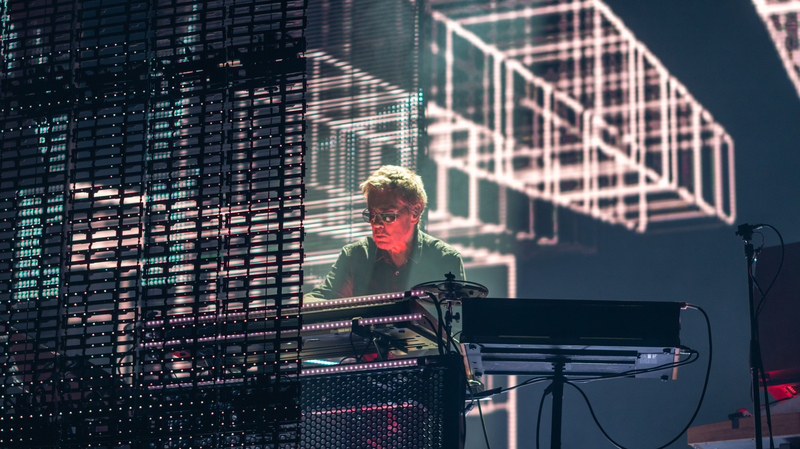 On the second, named Themes, Jarre compiled his most “catchy” songs, produced for the most part in the seventies and eighties (except for Bells and Chronology, Pt. 4), with the famous Oxygène, Part. 4, the Moroderian Equinoxe Part 5, and the iconic Fourth Rendez-vous. The third record, Séquences, focuses on more “hypnotic” titles, like Arpegiateur from 1982 and the psytrance Exit, composed with Edward Snowden in 2016, as well as the dance-floor bomb Oxygène 8, from the 1997 album Oxygène 7-13.